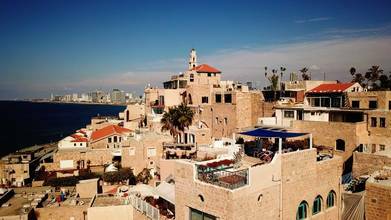 Jaffa is the southern and oldest part of Tel Aviv, Israel. The historic port city is known for its part in many biblical stories as well as its infamous oranges. First mentioned in an ancient Egyptian letter, scholars believe the port was built around 1800BC. Seen in this aerial video by MIAPVIDEOS, the ancient city walls blend seemlessly with the more modern parts of the city and the people within it. Description: For a break from the reveling that is Tel Aviv, Jaffa, an integral part of the Municipality of Tel Aviv-Jaffa, is a study in contrast and fascination - a magical ancient city where you can spend hours exploring the markets and galleries and wandering through the old, narrow alleys, A vibrant blend of religions and cultural beliefs, it also is one of the trendiest spots in Tel Aviv for shopping and eating out.